Networked buildings/education begin university’s transition to IP. A view of the Yale Law School master control room. It’s built to operate all the classrooms in the Sterling Law Building and Baker Hall. Yale University’s Sterling Law Building, the home of the Yale Law School on the university’s New Haven CT campus, looks like John Houseman might be seen at any minute, perambulating through its ivied masonry portals, a teaching assistant in tow to lug his books. The reality is, the Sterling Law Building is actually one of Yale’s portals into the future of higher education, in which multiple locations throughout the building—and, ultimately, throughout the campus and beyond—can be connected on a sophisticated high-speed network that is monitored and managed through a central control room. 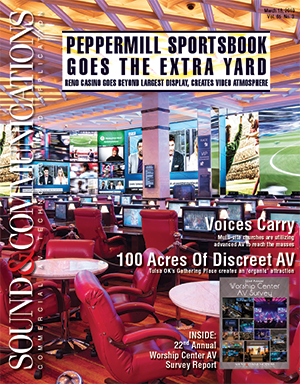 It also reflects the way AV systems integration, as an industry, is evolving, as vertical markets move deeper into IP territory. 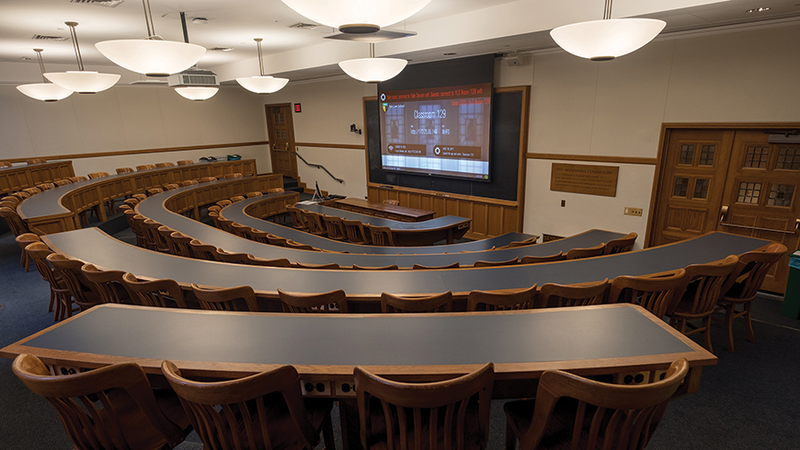 A wide view of Yale Law School classroom 124. The room’s equipped with projection, PTZ cameras, microphones and more. Daniel Griffin, the Associate Director of the Media Services Department at the Yale Law School, said that the Sterling Law Building is the tip of the spear in the law school’s thrust to an IP-based data distribution model, one that is serving as the template for the rest of the law school’s classroom infrastructure. Eight more classroom spaces in nearby Baker Hall will come online this year, with the same systems packages as the first two rooms, finished last summer. And, in the future, these might well become the model for the rest of the university. The Sterling Law Building was built in 1931 and, architecturally, it’s modeled after the English Inns of Court. Last summer, the building had a fully IP AV/data transport system installed, which serves to link two classrooms to a central control room. The key technology elements represent the kinds of platforms that, in just a few more years, will almost certainly become the norm. Those include IDK’s IP-NINJAR, a distribution system that essentially eliminates the AV switcher from the signal path, and Extreme Networks’ X870 Series switches, which can support up to 6.4Tbps switching capacity networks and which, here, are starting with a 10Gb network, connecting with a Panopto video content management platform. The processors for all of these are in a pair of Middle Atlantic racks, which are located in a control room where a Crestron TSD-2020-B control panel is the interface for Crestron’s PRO3 enterprise-class control system, which manages all the platforms. A view of Yale Law School classroom 124’s equipment rack. Local rack equipment is reduced, as all other equipment is in the master control rack. 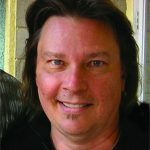 “We’re in a transition from switchers to switches,” Griffin observed, noting that the shift to an IP-based infrastructure is actually resulting in media closets that are less cluttered because of the elimination of hardware, such as media switchers, and the expansion of soft codecs like Zoom. “It’s pretty much the IDK NINJAR switches, the CTBs [the management and control box for IDK’s IP-NINJAR series 4K 10Gb Ethernet switches], the Crestron DGE-100 and an Extreme Networks switch in the service closets now,” he said. That has also greatly reduced the need for cooling and ventilation in those spaces. And, in an architecturally curated structure like the Sterling Law Building, that has a number of collateral benefits. classroom 129. There are dual microphones for lecture capture and a laser projector integrated inside. However, before the voyage to the future could begin, some very familiar and conventional processes had to take place—namely, pulling a lot of wire. Specifically, a lot of Berk-Tek 50µ OM3 fiberoptic cable—multimode fiber for shorter runs and single-mode for the longer ones—had to be pulled after first removing decades’ worth of copper and coaxial wiring. “We had to do a lot of crawling around in old plaster and millwork…it’s an old building,” Pat Nelson, COO of North American Theatrix (NAT), recalled. The systems integrator, based in Southington CT, did the project for Yale. According to Nelson, a project that combines old-fashioned wire fishing with a 10Gb network is an inflection point for the industry, as it begins to transition to an AV-over-IP model. “What we’re doing is getting buildings like this prepared for the future,” he stated. Actually, Nelson said, they are more precisely transitioning from an intermediate step in the evolutionary process…from what would have been an HDBaseT network just a few years ago. 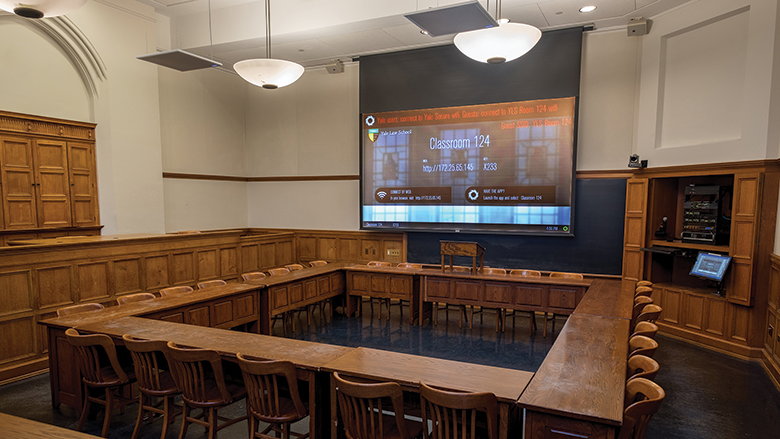 The goal, in any event, was to connect the document cameras, audio systems and projectors in two classrooms in the building with a new central control room in the same building. The new 10Gb network will be the foundation for an expanded network, which will incorporate more classrooms at the Sterling Law Building and which, eventually, will extend to other locations on campus. That process will begin again during the summer. Certain system components, such as the Extreme Networks switch, were chosen with that expansion in mind. It offers 96 10Gb ports, only half of which are being utilized in the initial iteration of the system. 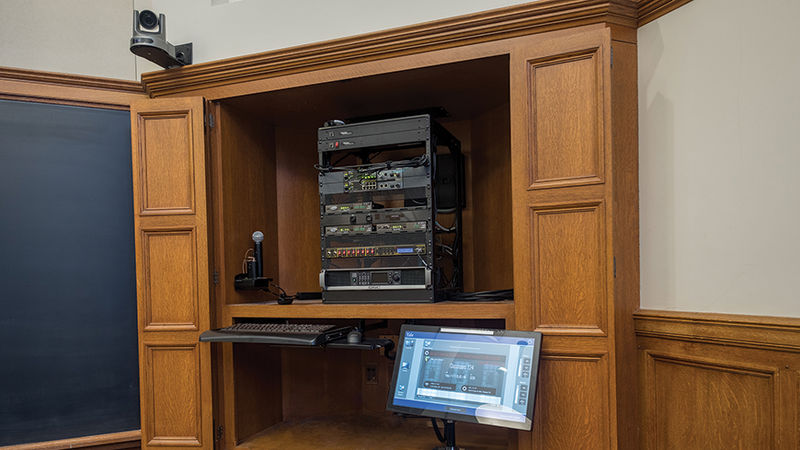 “The IDK IP-NINJARs act like the typical HDBaseT transmitters and receivers we used to use, in that they take audio and video from an input device to a projector,” Nelson explained. “Now, manufacturers like IDK are using the AptoVision chipsets, which allow the transmitters and receivers to run over 10Gb network cabling to an Extreme Networks switch to the IDK CTB computer, which issues commands for transmitters and for routing. So, there’s no switcher or scaler anymore. That’s the beauty of this approach—no need for a switcher, and you get infinite scalability.” Nelson said that this configuration also allows a switch to so-called soft codecs, such as Skype, WebEx or Zoom (the Sterling Law Building system uses Zoom), which do away with hardware-based transmission codecs and keep the entire ecosystem in a virtual environment. There is still hardware involved, of course. The Panopto device is the classroom and lecture-capture platform, and it takes input from five Shure ceiling-array microphone systems and two Shure handheld or lavaliere wireless microphones, along with QSC PTZ cameras across the pair of classrooms, which can also see what’s on the Sony flat-panel displays in each room, all of which NAT installed. All of that can also be monitored on the 2×2 display in the control room at the other end of the building, set up to view up to four discrete outputs from classroom cameras and other devices. It’s also sent to a cloud data center, from which students can retrieve classes and lectures on demand. NAT’s willingness to cooperate with Yale on matters like that might be why the integrator’s relationship with the school goes back more than a decade. Although the integrator’s been working on classrooms at Yale for two years, 10 years prior to that, it first began to work on the theatrical and performance spaces that are at the heart of its portfolio. Nelson cited a hybrid theater space used as a classroom for teaching theater arts as the transition point in the relationship. “That was our gateway to the teaching side here,” he affirmed. 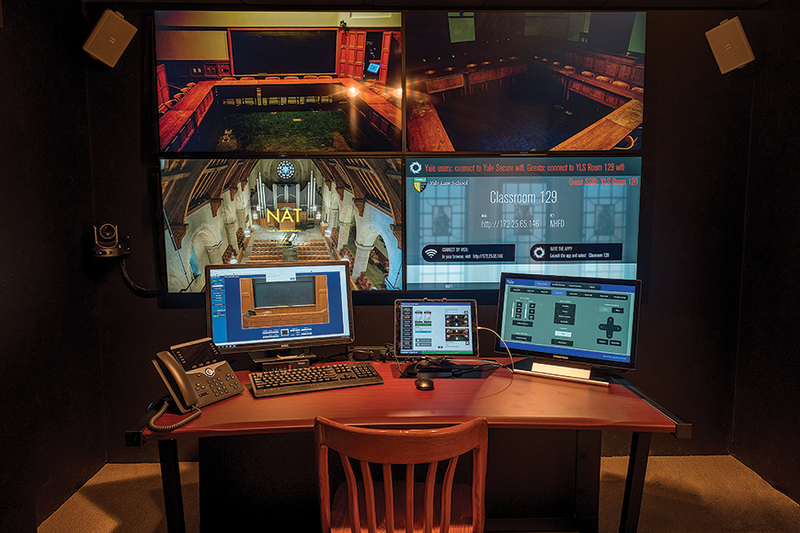 In the control room, a QSC CORE 510i integrated core processor manages the AV and data signals over a Q-SYS network, which connects to Crestron for control. The Q-SYS also provides DSP functionality for the audio system, such as echo cancellation and equalization. Nelson said that the CORE 510i is only a couple months old, and it starts the new network on as advanced a footing as it could have; a 512-channel system will let it expand as the number of nodes on the network increases. (Of course, IP-based systems like these will always be under pressure to implement the latest versions of their key components.) System managers can monitor the AV and data from each room, and they can also have a full-duplex conversation with instructors who have problems with, or questions about, the system’s operation via a help button on the classroom’s GUI. They also have the ability to override classroom systems control, should that be necessary. Griffin credited NAT’s staffers with working closely with his team members during what was, in retrospect, a significant culture change, all originating with the shift to IP. For instance, the AV team now works as an integral part of the school’s IT department. What also helped is that many of the GUI components in the classrooms used by instructors remained mostly the same (the school’s own IT/AV team is in the process of upgrading its touchscreens), and the central control room’s comprehensive monitoring capability enables the quick dispatch of a technician to any room, if he or she sees a glitch occurring. That, Nelson added, is the best lesson to be learned as integrators peer over the precipice to a future of networked IP distribution of AV.